Below is the results of the diligent work of our staff presented as a report on our often frustrated attempts to find the legal minimum level of transparency withing local government. This is a report on the public records requests, practices, and results surrounding Yellow Springs Exempted Schools. It will attempt to be in chronological, with as much detail as possible. On April 9th, citizen journalist Athena Fannin requested four personnel files: Tim Krier, Mario Basora, Shannon Morano and Jack Hatert. Looking through the files, the page detailing what the superintendent is indemnified from appears to be absent. This is not a redaction it been a redaction it would be in black. Had there been no more text the sentence would have ended with a period. A page is missing, or the information has been whited out or removed, it is the complete absence of a page of a public official’s contract. Krier’s personnel file contains a one page, heavily redacted,“Update on high school” email sent March 13th, 2018, within which Jack Hattert is appointed as interim High School Principal. Like Basora’s contract, a page seems to be missing. A letter dated March 15th, 2018, instructs Mr. Krier to schedule a time with Basora during the student-free weekend to “...collect all of your personal belongings from the school.”. It is typical for staff and faculty of schools to return equipment and refrain from contacting students while on an extended leave of absence. However, being instructed to clean out their desk is unusual for someone who is eventually expected to return to work and could have returned to work as early as April 24th, 2018. The last scheduled day for teachers is June 1st, 2018. There was nothing suspicious or odd to be noted in either Guidance Counselor Morano’s or Assistant Principal Jack Hattert’s personnel files. This is to be expected since they followed their duty to report which indicated multiple students involved in the reported sexual offense. A miscellaneous incident CAD entry obtained in a request from the YSPD indicates that something happened at the high school as Officer Nipper was sent to pick up undescribed statements twelve days later. It the April 12th, 2018 Yellow Springs Board of Education meeting, this reporter and another journalist, Micah Naziri, asked questions about the safety of Yellow Springs Schools, the mechanisms to prevent and address sexual assaults, and bullying. This reporter also asked for the policy regarding threats of school shootings with a question regarding the length of time that there was a known sexual predator in their schools. Not one member of the Yellow Springs School Board responded despite a police report detailing a threat being attached to the email. On top of Gerry Bello’s analysis of the board’s leadership protocols, this requirement of mutual agreement effectively means that the superintendent has veto power over elected officials in matters of the agenda. On April 19th, this Mockingbird reporter requested five personnel files: Sarah Lowe, Angela Bussey, Azure Hickman, Shawn Jackson, and Yvonne Wingard. These names were gleaned from a Greene County Courtview search for “Yellow Springs Exempted Schools”, combing through Yellow Springs News archives, and an old petition available on the internet. Initially, the cost was estimated at 150$-200$, which seemed like a vain attempt to out-price the reports. Electronic files were requested in lieu of hard copies. Fees are not permitted for electronic transmission of public records requests, which means they bypassed my request for non-fee email request then quoted an astronomical fee. Fees were waived. 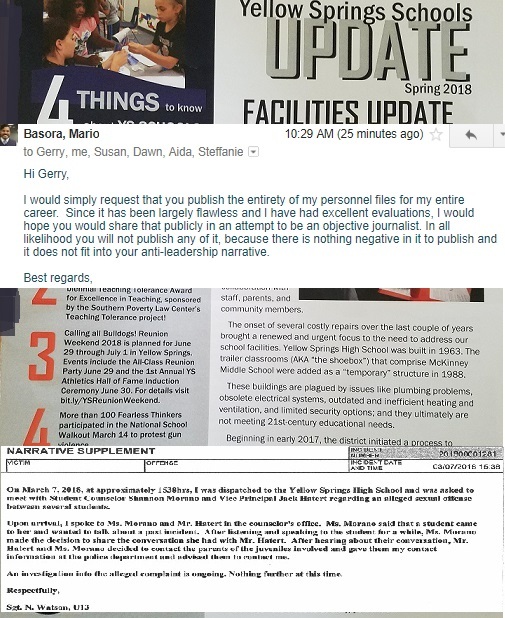 The only personnel file received thus far (received on April 27th) has been the personnel file of Sarah Lowe--who was uninvolved in any lawsuits with Yellow Springs Schools and retired after a full thirty-five year career--and Angela Bussey who filed a lawsuit against Yellow Springs Schools. A quick perusal of Bussey’s personnel file suggests that asking a member of the Yellow Springs Schools staff who in a contentious place to clean out their personal belongings is not standard procedure. This Mockingbird reporter attends the Antioch College Wellness Center at the same time that the superintendent does. On April 25th, after this reporter greeted him, Mr. Basora revealed that he knew of public records requests regarding himself submitted to his former district: Wyoming City Schools. This was before the records request was even fulfilled. I contacted the custodian of records for an explanation. The custodian responded, “Per the master contract between Wyoming City Schools and Wyoming Education Association...‘...[sic]Any request to view a member’s files will be communicated to the member by the Superintendent and/or Building Principal.’.” The contract does not explicitly state that former members of the district would be contacted, but the custodian of records indicated that such contact would be a courtesy when possible. This reporter was given a copy of the administrator salaries for the last 5 years with great speed and told that there are no raises or salary increases promised to any administrators, as this is a facilities request. For the second item, there were no responsive records to indicate any advisement to district employees about what constitutes acceptable campaign practices. For the fourth, consulting Burges and Burges was entirely by the Levy Committee. Total fees charged to Yellow Springs Schools by consultants to this project was $29,130 to Ruetschle Architects and $9,692 to WSU/APRI for School District Survey for facilities. The flyers that the Yellow Springs Schools mailed out seem an awful lot like district paid-for advertisements for the levy. If they are not advertisements for the levy, they certainly inhabit a grey area as they are mailed from the school not the listed address of the levy committee and make use of the School's symbols and motto. Furthermore, this reporter was told by a representative of Yellow Springs Schools that Levy Committee “Contact information such as home address and phone numbers are not public records. Personal identifiable information is not public record” which is untrue. If anyone (Treasurer, Superintendent, Executive Assistant) copied on this email knew that the statement was untrue, they never bothered to correct the Administrative Assistant about her error to ensure this request was fulfilled. Despite this, this reporter was able to quickly gather the data about the Levy Committee from the Greene County Board of Elections within the day. The results of the levy committee request show quite a lot of personal information, which should come as no surprise to anyone familiar with election procedure: Political Action Group names, addresses and phone numbers; voter registration information; and campaign finance reports are public information. Readers may remember the $29,130 that was paid to Ruetschle Architects for intital design work. Thus one of the consultants to the schools is also one of the largest contributors to the levy committee’s budget. Was there some worrying about the most expensive consultant to the schools being revealed as a major contributor to the levy campaign? This reporter was sent this article, which did not really address the point that campaign finance and committee information is public information. It is however correct about the contact information. The public officials of Yellow Springs Schools have blocking people who oppose the May 8th school levy in Yellow Spring’s Facebook discussion groups. This amounts to censorship by a public official, as “blocked” members of Facebook cannot see or comment on their activities. Levy Committee Member TJ Turner and Superintendent Mario Basora have blocked journalist Minerva Barker. They have blocked administrators of the discussion groups. They have also blocked anyone else that dissents. Between the odd dates for Krier’s departure, silence from the Board of Education, and incorrect information regarding election procedure, it’s hard to view this levy in a positive light. It could be interpreted that there is a coverup of the Kriers’ misdeeds by poorly informed (at best) and purposefully obfuscating (at worst) public officials in an attempt to pass the levy. The Mockingbird is not the first to come to that conclusion, but the Mockingbird does have the most information. It could be that the school board does not back the superintendent. Some members of the community are worried about reprisals which will be taken out against their children. Community members have expressed these fears to our staff on more than one occasion. Asked for the empty pages, the mockingbird received this response: Which constitutes a flagrant violation of Ohio's public records law in writing. The entire school board was copied. They are largely flawless. Except of course for this flagrant refusal of a request of public records. Perhaps this is the first time he chose the wrong horse (Krier). In which case he would have chosen very wrong. This author is worried about reprisals against future children he plans to have should they be raised in a community where rapes in schools are covered up in the name of money and the prestige of a new school. While schools are typically sacrosanct and unquestionably holy places within a community, Yellow Springs’ schools would benefit from more scrutiny. Six weeks from March 14th, 2018. Time was not available for a full reading. The full files will be reviewed at a future date.